Teeth play an important role in digestion of food. Teeth help in biting and chewing food, thus make swallowing easier. It is important for you to understand the type of teeth you have and what their primary functions are. 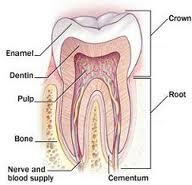 Crown: It is the visible part of the tooth that gives shape to the teeth. Gumline: This is where gums and teeth meet. Root: Part of the tooth that is embedded inside the bone. Enamel: The outer surface of the tooth that is white and shiny. Dentin: Underlying layer of the enamel is called dentin. Pulps: Pulp is a soft tissue in the center of the tooth where the blood vessels and the nerves are located. Human beings grow two sets of teeth in their lives. The first is the primary teeth, called milk teeth and the second set are permanent teeth. Children develop twenty primary teeth and therefore, are replaced by permanent teeth by the age of 13 years. There are thirty-two permanent teeth in adults. Primary teeth: Primary teeth develop inside the gums when the baby is still in the womb and appears externally as oval buds when the child is about 6-8 months old. As the teeth grows, it is pushed out of the gums. This procedure is known as ‘teething’. At the age of two, the entire set of twenty deciduous teeth, ten in each jaw emerge. These consist of three kinds of teeth, each jaw having four incisors, two canines and four molars. These teeth help the permanent teeth to erupt in their normal positions between the ages of 3 and 12. The deciduous teeth start making way for the permanent teeth as their roots begin to dissolve and by the time the permanent teeth are ready to erupt, the crown of the deciduous tooth becomes loose and fall out. Permanent teeth: There are thirty-two permanent teeth, sixteen in each jaw having four incisors, two canines, four premolars and six molars. Incisors (four in each jaw): Two teeth that are at the middle of each jaw are called central incisors and the other two teeth at the side of each jaw or next to central incisors are lateral incisors. The primary functions of incisors is cutting and tearing of food. These teeth are not only important for eating food, but also for aesthetic appeal as they are visible when you smile, talk and eat. There are two canine teeth in each jaw. These teeth are pointed and have long roots. Canine teeth are bigger than other teeth. These teeth are used for cutting food like meat. These teeth are called grinding teeth. They have a broad humped surface which enables easy mashing of the food. These small surface humps are called cusps. Generally there are two cusps in premolars and are often referred as bicuspids. Molars along with the premolars are used for crushing and grinding food. The molars are much larger than the premolars. The molars have generally three to five cusps. The last molar in each jaw is commonly known as ‘wisdom tooth’. Wisdom tooth develops after the jaws grow and space out making place for them. As such, the permanent molars appear in adulthood. Wisdom teeth grow between the ages of 18-21 years. Brushing and flossing everyday along with regular dental checkups helps in preventing tooth decay and gum problems. Why You Should Visit Dentist Every Six Months? This entry was posted on Tuesday, October 29th, 2013 at 5:24 am	and is filed under Dental Health. You can follow any responses to this entry through the RSS 2.0 feed. You can skip to the end and leave a response. Pinging is currently not allowed.